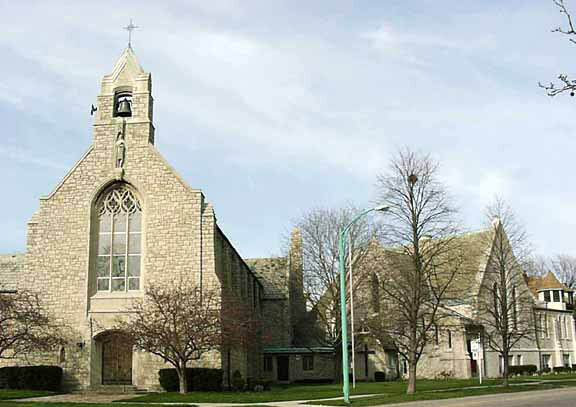 On the 23rd April 1910 William Henry Helm Brown married Winnifred Dora Houghton at the Grace Episcopal Church in Buffalo, two sons were born, Angus M Brown born 1911 and William Henry Helm Brown Jr born 1914. The family were living at 698 West Devlan Street. Brown by that time was President of the William H.H. Brown Company, representatives of the Continental Rubber Company of Erie. On the evening of the 28th April 1915 William Henry Helm Brown celebrated his 34th birthday with his family. Joining him were two brothers, Frederick and Albert Perry. Having engaged in business in the US the brothers were heading back to England aboard the Lusitania, Brown would be accompanying them, departing New York on the 1st May. My brother, an American friend who was traveling with us for his health and who intended to return with my brother on the Lusitania next Saturday as my brother was taking up a permanent position with the Pierce Arrow Co, were lunching with me, and as we were finished quite early we went up several decks to the lounge for a smoke. It was then ten minutes to two. Shortly after two o’clock, just before the people began to get up into the saloon there was a terrible impact, marked not so much by the noise as the force of the explosion. It shook the vessel from stem to stern as though we had struck a rock or collided with another vessel. We immediately realized that we had been hit by a torpedo. Our American friend was not with us at the time, but my brother and I walked through the lounge to get down to the boat deck. We were met at the entrance to the lounge with a fearful volume of smoke and steam, caused by the explosion, which apparently had reduced the speed of the ship very suddenly. Before we could realize the position, there was a second shock, which came within a minute or two of the first. By this time there were many people coming up the stairs from the lower decks and the dining saloon. We managed to get out onto the boat deck, which was then very crowded, considering the majority of the people had been in the dining saloon. Most of the people appeared to have come from the second saloon over the communicating bridge. My brother and I then got separated, nor did I see our American friend, Mr. Brown who had gone down into the library after dinner to write some last letters before landing. Although desperate for news of her Husband, Winifred Brown she was very relieved to receive a cablegram stating: “Am safe in Queenstown, Will write. Let mother know”. In an interview with her local newspaper, Mrs Brown told them her husband had a premonition of the disaster. She told them that her husband had said to her before leaving “If the Lusitania sinks” you can picture me bobbing up and down on top of the waves. 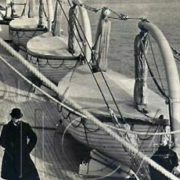 My dream tells me the ship will meet with disaster, but I am sure I will be saved should the vessel be sunk”. She continued the interview saying: “My husband’s dreams always come true, of course am anxious about him, but am just as sure he is alive and well as if he were standing at my side this moment. I felt no uneasiness when Mr Brown sailed, not withstanding his words of foreboding. When the news of the wreck first came I was shocked, but I recovered. I know his dream has come true in every way. At 11pm on the evening of Saturday the 8th May, Browns parents received a phone call from their daughter in law saying that she had just received a cablegram from Frederick Perry stating that Brown’s body had been recovered and identified along with his brother Albert’s. 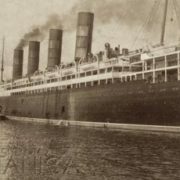 A message from the American Consul explained that when, a few hours out of Queenstown Brown was one of many passengers who had sent messages in advance to relatives to avoid the rush when they docked in Liverpool. Browns body was identified as # 117, it was laid out in the morgue where it was photographed in a row of bodies that included, Steward Charles Gilroy with an infant child resting on his chest and Mrs. Catherine Barr. His body was forwarded to the American Express Company, Liverpool for internment on the 14th May. The whole family including Brown’s parents including his 6 brothers were devastated by the sad news. His property was handed over at Queenstown to Mr Lewis. C. Thompson, Vice Consul, American Consulate at Queenstown. 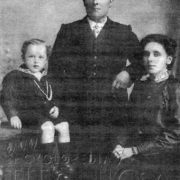 On the 5th May 1916 Winifred Brown filed suit along with other families against the Cunard Steamship Company claiming they were “negligent in their methods of of navigation through German submarine lines”. In October 1917, Brown’s widow Winnifred married Elmer S. Keay, an American national, secretary and treasurer of a wholesale coal company of New York. 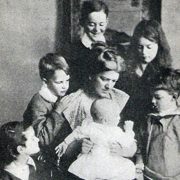 In September 1918, they had a daughter. On the 21st February 1924 the following claim for compensation was awarded to Brown’s widow and two sons. 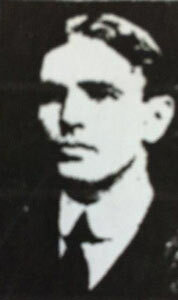 William H. H. Brown, an American national, 34 years of age, was a passenger on and went down with the Lusitania. He was survived by a widow, Winnifred Houghton Brown, and two sons, Angus M. and Wm. H. H. Brown, Jr., aged 27, 4, and 1 year’s, respectively. 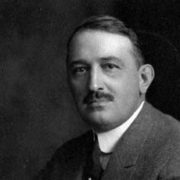 In October, 1917, the widow married Elmer S. Keay, an American national, secretary and treasurer of a wholesale coal company of New York. To her was born, in September, 1918, a daughter, the issue of this last marriage. The decedent was the proprietor of a mill supply and rubber goods business at Buffalo, New York, from which he earned something more than $5,000 per annum. After his death this business, of which the good will was presumably the principal asset, was sold for $8,000. 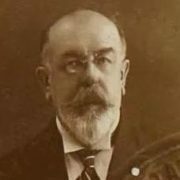 The decedent was physically strong, active in business, industrious, and respected in the community in which he lived. His wife and sons were wholly dependent on him for support. No claim is put forward for loss of personal property which decedent may have had with him at the time of his death. Applying the rules announced in the Lusitania Opinion to the facts in this case as disclosed by the record, the Commission decrees that under the Treaty of Berlin of August 25, 1921, and in accordance with its terms the Government of Germany is obligated to pay to the Government of the United States on behalf of (1) Winnifred Houghton Brown Keay individually the sum of ten thousand dollars ($10,000.00), (2) Angus M. Brown the sum of fifteen thousand dollars ($15,000.00), and (3) William H. H. Brown, Jr., the sum of fifteen thousand dollars ($15,000.00), all three amounts to bear interest at the rate of five per cent per annum form November 1, 1923; and that the Government of Germany is not obligated to pay any amount on behalf of the Administratrix of the Estate of William H. H. Brown, Deceased. Done at Washington February 21, 1924. Winifred Brown Keay died on the 10th June 1974 at the age 86. She was cremated and buried in Buffalo.